The following morning, she had already been in her kitchen for hours when I stumbled across her picking fig leaves as the rest of the masseria slept. An espresso appeared in my hand, and as we chatted, I watched her pull a tray of cornetti (her second that morning) from one of many ovens, and simultaneously drape the fig leaves over an apricot and lavender cake before setting them onto a white-clothed table that was already covered with warm brioche, crostate thickly spread with homemade marmellate (jams), and several other muffins and cakes dotted with chocolate and seasonal fruits. 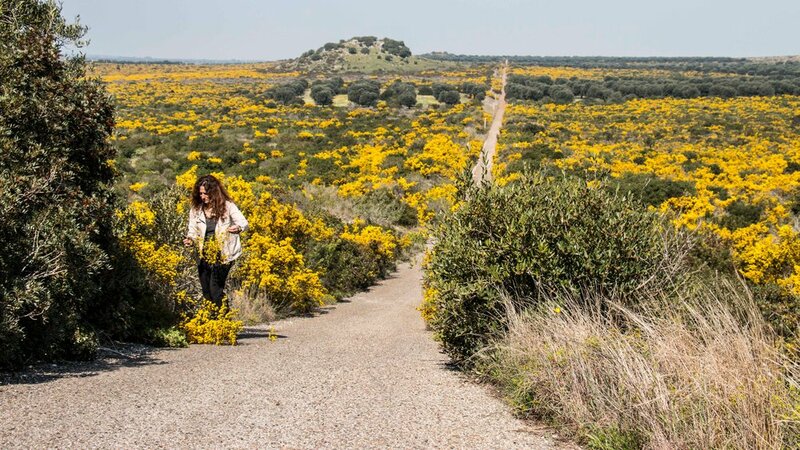 As soon as the last tray of pastries was plucked from the oven, Maria rushed me to her car and we spent a couple of fleeting, but precious hours foraging wildflowers in the countryside that surrounds the estate and rolls towards the sparkling Ionian sea (about 15 kilometres east). As we reached the coast, she showed me carpets of pungent, purple-flowering wild thyme and we picked the the first flush of fruit (called ‘fiorini’) from a sprawling fig tree. Back at the masseria, staff were waiting to whisk away her carful of flowers, and I rushed to the breakfast table afraid that I might have missed out. I needn’t have worried. I hurriedly took the photo above; greedily filled my plate with as much as it could hold; kissed Maria goodbye and savoured every mouthful as we drove west to Bari. I thought of Maria’s apricot cake for months, until as fate would have it, her delightful daughter Chiara made the long journey to spend summer in Sydney. When we decided to cook together, I filled a basket with apricots, and asked her to show me the secret of her mother’s cake. Through this cake, Maria and Chiara have shared a piece of the masseria, and with each slice I am transported 15,867 kilometres away, back to a week spent in Puglia last summer. Lay the apricots on a large tray, top with 80 - 100 g caster sugar (depending on their sweetness) and half the lemon zest (if using). Leave them in the hot sun for a couple of hours until jammy and very soft*. Scatter the softened apricots with a teaspoon of the lavender and set aside. Butter and flour a 23 cm / 9 “ spring-form cake tin. Preheat oven to 190C fan (200C convection). Cream the butter and remaining 200 g caster sugar until fluffy and pale. Add the eggs, one at a time, then add the olive oil and yogurt, beating with each addition until smooth. Stir through the flour, baking powder and a pinch of sea salt and mix until just-combined. Arrange half the apricots on the bottom of the greased tin, pour over the cake batter, then top with the remaining apricots. Sprinkle over the remaining lavender or lemon zest and a tablespoon of demerara sugar. Bake in the oven for about 45 minutes, until the crust is deep gold and a skewer comes out clean. Leave in in the tin for five minutes, then invert onto a rack to cool slightly before serving. * On an overcast day, the apricots can be softened in a low oven for two to three hours instead of in the sun.